Summer is in full swing and so is grilling season! With the heat wave so many of us are experiencing the past few weeks, cooking outdoors makes the most sense! Why heat up the kitchen when you can throw some chicken or burgers on the grill for a quick meal?! My favorite summer condiment is barbecue sauce. I use it on almost everything! Chicken, pork chops, burgers, steaks, fish. I even use it in place of ketchup on my fries or grilled potatoes! Butch's Smack Your Lips BBQ Sauce is the brand I like to have in my pantry at all times along with Butch's Magic Dust Dry Rub (which, by the way, is awesome on fries!!!). For no other reason than it's summer, Butch's Smack Your Lips BBQ is allowing me to share their great products with one lucky winner! One lucky reader will receive a bottle of Butch's Smack Your Lips BBQ Sauce and a jar of dry rub in the flavors of their choice! Six ways to enter! You may complete one or all of the tasks below to enter! 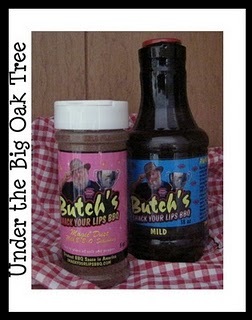 Visit Butch's Smack Your Lips BBQ and tell me (in a comment on this post) which flavor BBQ Sauce and dry rub you would like to win. LIKE Butch's Smack Your Lips BBQ on Facebook (let them know that Under the Big Oak Tree sent you) and come back and leave a comment on this post letting me know you did. Enter our other giveaway: Aurora Natural Original Salad Fixin's (come back and leave a comment here letting me know you did). LIKE Under the Big Oak Tree on Facebook (there may be ways to earn additional entries posted there throughout the length of the giveaway). Leave a comment here letting me know you did. FOLLOW Under the Big Oak Tree (@thebigoaktree) on Twitter and leave a comment here on this post letting me know you did. Leave a comment letting us know your favorite way to use barbecue sauce. This giveaway ends Tuesday, July 31st at 10:00pm, EST. Your comments are your entries into this giveaway. Please remember to leave a separate comment for each completed task. One winner will be chosen via random.org and will then be contacted via email. Winner will have 48 hours to claim their prize or another winner will be chosen. Please provide your email address so that I may contact you should you win. I was not financially compensated for this review. The sponsor provided me with a non-returnable prize pack including samples of the product mentioned in this review. The sponsor is also providing the same prize pack for the lucky winner of this giveaway. All opinions and thoughts mentioned in this post are honest and my own. Oh yum! The mild BBQ sauce sounds wonderful! Thanks for the chance. I also entered your Aurora Natural Original Salad Fixin giveaway as well. Yeah!!! Wed love to try the mild BBQ sauce! Already like Under the Oak Tree on facebook. My family loves BBQ sauce to dip everything in!! Eggs, fries, meat, etc!! 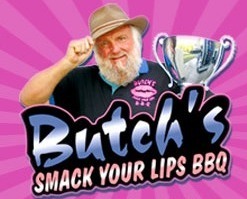 I liked Butch's Smack Your Lips BBQ on facebook and told them you sent me!